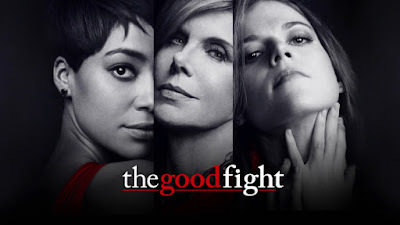 I emerged from the great and grand Star Trek Cycle and immediately tripped and fell headlong into two legal dramas that I had heard about, but hadn't gotten around to watching just yet: The Good Fight and The People vs. OJ Simpson. The Good Fight was the first new show out of the gate for CBS All Access and helped launch the streaming service. A spin off of The Good Wife, it picks up the action a year after the finale, when Diane Lockhart (Christine Baranski) is finally ready to hang it all up and sail off into the sunset for a well-earned retirement. Unfortunately, life gets in the way and when she loses all of her life savings thanks to a Ponzi scheme orchestrated by Henry Rindell (Paul Guilfoyle) whose goddaughter Maia (Rose Leslie) has just passed the bar and is starting her career. Her life savings gone and her old firm not willing to take her back, Diane winds up finding a lifeboat in the form of Adrian Boseman (Delroy Lindo) of the prestigious African-American owned firm Reddick, Boseman and Kolstad who has made it's name by taking on police brutality cases in Illinois. With a good reference from her former associate Lucca Quinn (Cush Jumbo), Diane brings Maia aboard as well and roll up their sleeves and try to start over, navigating their personal lives and the cases and their new firm as best they can- with a friendly face in the former of Marissa Gold (Sarah Steele) joining Diane as her secretary. There are the outlines to something really, really good in the first season of The Good Fight. I have to wonder if the fact it's premier was moved up due to production delays on Star Trek: Discovery might have something to do with it because it can feel a little rough here and there- especially in the early episodes. But it's firing on all cylinders by the end of it's first season. Alicia Florrick and all things Florrick are wisely absent from the First Season, which gives the cast a chance to stake out it's own territory without being overly beholden to it's predecessor. Some old favorites from The Good Wife do show up though: Gary Cole returns as Kurt McVeigh, Diane's husband. Carrie Preston is back as Elsbeth Tascioni and Matthew Perry shows up as Mike Kresteva- Neil Gross, Colin Sweeney and Dylan Stack all pop up here and there as well. I think the difference between The Good Fight and The Good Wife is more of where the show seems to be focusing. Wife was more about the journey of Alicia Florrick whereas Fight is more about the actual, well, fight of it all. Maia's family drama, while an integral part of introducing and building her character in the show isn't at the center of the show and I think it's a nice change of pace- because the courtroom battles and legal shenanigans make for one hell of an entertaining ride. My Verdict: I'm not sure this is Frasier just yet, but it sure as hell ain't Joey either. *** out of ****. The People v OJ Simpson: American Crime Story is nowhere near as ponderous as it's title suggests, in fact, it's sort of a weird time machine vortex back to the mid-90s when everyone in America was hyper-focused on pretty much every aspect of the case. Based on Jeffrey Toobin's book The Run of HIs Life: The People v OJ Simpson, the producers made this appointment television just on the sheer talent they assembled for the cast alone, but the way they tell the story of the case is absolutely riveting. Despite having memories of this case and having lived through it (I remember when the television cut live to the verdict and everything in junior high stopped in a way that it probably didn't stop until the morning of September 11th, 2001- it was that big of a deal.) this was still a fascinating series to watch. Starting with the discovery of the bodies of Nicole Brown Simpson and Ron Golden, OJ Simpson (a fantastic Cuba Gooding Jr.) immediately becomes a person of interest in the case and then the suspect, the series takes you all the way through the chase in the White Ford Bronco to the ups and downs and ins and outs of the trial itself and right up until the verdict. The cast is what makes this. Sarah Paulson is excellent as Martha Clark and Sterling K. Brown got a well-deserved Emmy for his role as Christopher Darden. Courtney B. Vance becomes Johnnie Cochran and John Travolta, Nathan Lane and David Schwimmer round out the defense team as Bob Shapiro, F. Lee Bailey and Robert Kardashian. (Schwimmer is especially good in this.) I straight up did not recognize Selma Blair as Kriss Jenner, either as you go through familiar faces sort of pop here and there- Evan Handler as Alan Dershowitz, Jordana Brewster as Denise Brown. It's an amazing cast- and because the cast is good, I think it gives the show room to play with some interesting themes and make some subtle points.